After the first day of the conference, I am so energized and ready to get back into my classroom! That is the effect that a great conference can have on an educator. 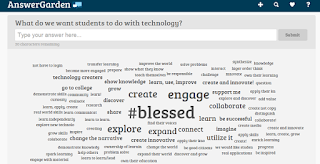 So here are my favorite takeaways from day 1! In the past, I was able to be a part of the Idaho Leads Project (#expectsuccess) and through that, I was able to learn a lot from Dr. Russ Quaglia and his people at the Quaglia institute. In one of the sessions today we watched the video Ned's Gr8 8. There were two big things that struck me about this video: Students cannot be successful if they are not okay and we need to get back to a focus on mastery based learning. You can check out the video below or here. It's Microsoft Office... and it's FREE for educators and students! This is awesome! In the past I've purchased educator licences of Microsoft Office and installed it at home, but with Office 365 you can get it for free if you're an educator or a student. You'll just need to use your school email to get to it. Office 365 has a TON of features so I'm just going to highlight my favorites from the session today. Groups - allows shared calendar and documents through One Note. It also puts all your emails from that group in one place. Word has an Add in called Office Planner. It pulls in standards and brings up a template and incorporates those in the document. It even includes activity ideas! Sharing! Check out docs.com! It's a place where you can share any kind of Office document with the world. This was just one tidbit found in Kim Miller's presentation about STEM and inquiry in the elementary classroom but it seems like something that I can easily implement within my classroom. The premise is that students create Stop Motion videos using an app that allows them to share their process and understanding of a math concept. I stumbled across Answer Garden on Twitter. It was featured at another session but I just thought that it was so awesome and something that I could easily implement in my classroom. You post a question and people answer it. 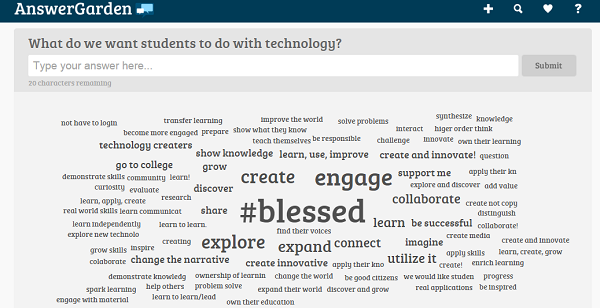 Then the site produces a word cloud (like Wordle or Tagxedo) of the responses. This is great for a quick check of understanding or an alternative to polling the class with fixed answers. For years I have done screen captures. My software of choice is the SMART capture that comes with the SMART Notebook suite. Until today! Today I learned about Snagit which is an extension for the Chrome browser that does EVERYTHING that SMART capture and other screen capture software does. You can pick a window, an area on your screen, or a tab. This is simple enough that I think that I will even use it with my students. I think it's pretty powerful when students are able to share and explain their thinking/reasoning and this extension will help get my class there. The best part is this is free and it works with Chromebooks!